Using moisturizer is something that most women do but it is very important to make sure that you are reaping the most benefit out from it. 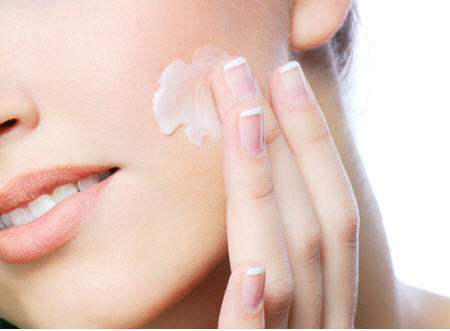 The following are some expert tips when choosing and wearing moisturizer. Do use moisturizer that contains sunscreen. Sunscreen is not only important for preserving the skin but wearing moisturizer with SPF saves time. This is a great way to combine skin hydration and SPF application in one swoop. Do use a moisturizer designed for your skin type. Every skin is different and thus, every person has unique needs in terms of choosing skincare products. Since moisturizer is a staple in both day and night skincare regimen, we obviously wear it round the clock, 365 days a year. Therefore, it is important to wear one made exclusively for your type of skin – oily, dry, combination or normal. If you have sensitive skin, do avoid moisturizer that contains synthetic fragrance. People with sensitive skin may react negatively to chemical and synthetic substances. Before you buy a moisturizer, check the ingredients on the label and if you see ‘fragrance’ or ‘parfum’ listed, avoid it. Don’t use a moisturizer with sunscreen at night. Sunscreen is used to protect your skin from being harmed by the harsh environment. Allow your skin to breathe and relax at night with a gentle, light moisturizer to aid your skin while in repair mode. Do include the neck when applying moisturizer. The neck is an extension of your face and it also needs attention. Do switch moisturizers every winter and summer. Your skin has the ability to maintain moisture correlated to the weather you are living in. If you are used to a humid place, you may have to use a light moisturizer. This concept also applies to the changing seasons. During summer, use a light moisturizer. During winter, cold air can dry out the skin so take care of it by applying a heavier coat. Do apply moisturizer uniformly. If you are suffering from clogged pores near your ear and around your hairline, it may be caused by how you apply moisturizer. When you start using moisturizer at the middle of your face, massaging outwards, most of the moisturizers settle at the perimeter of your face. It may clog the pores and excess oil is produced and pimples appear. Be conscious on how you apply your moisturizer. Don’t rely on moisturizer to hydrate your skin. If your skin feels dehydrated and it feels like you need more, consider the hydrating benefits of alcohol-free serums and toners. You may need them in your daily regiment to boost the effect of your moisturizer. Don’t forget to damp your skin before applying toner to enhance the hydration when moisturizer is applied. The world of skincare is full of many amazing secrets. Follow these tips on using moisturizer to keep your skin hydrated and healthy. Wrinkle reduction treatment is not only for wrinkles and facial lines. In 2013, the FDA extended the indication of Wrinkle reduction treatment to include overactive bladder (OAB). Overactive bladder is not a disease. It’s a collection of symptoms associated to the function of the bladder. Sudden urge to urinate. A person with OAB experience an urgent, overwhelming, intense need to urinate. It is so sudden that you have trouble reaching the toilet in time. Urinary frequency. Within 24 hours, you don’t have to pee for more than eight times. If you keep on going to the bathroom, you may have OAB. Disturbed sleep. Overactive bladder may disturb your sleep, making you wake up two or more times every night to pee. This symptom is called nocturia. Urine leakage. Leaking urine is a sure sign that there’s something wrong. Leakage can be minimal like a few drops or they can be more serious. Wrinkle reduction treatment has been approved to address OAB symptoms such as leakage, frequency and urgency in adults when medications such as anticholinergic doesn’t work well or can’t be taken. Wrinkle reduction treatment for overactive bladder is a unique approach that target the root cause of OAB – the bladder muscle itself. If you are diagnosed with OAB, Wrinkle reduction treatment can greatly help your OAB symptoms. Wrinkle reduction treatment for overactive bladder targets the bladder muscle and nerves by blocking the signals that cause OAB. Specific body chemicals travel from your nerves to your muscle cells to trigger contraction of your bladder so you can urinate. 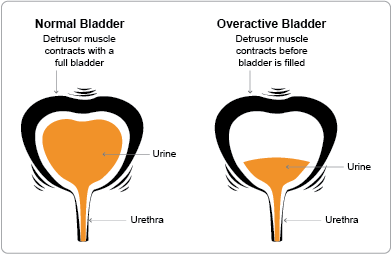 But with OAB, your bladder muscles contract uncontrollably so you frequently feel like you need to urinate. Wrinkle reduction treatment can help calm the nerves that cause OAB, helping you reduce leakage episodes, lessen the frequency of your urination and resolve the intense need to empty the bladder right away. Based on clinical trials, patients noticed that at week 12, their daily leakage episodes reduced by 50 percent or more after the Wrinkle reduction treatment for overactive bladder treatment. About 1 in 4 patients reported they were no leakage episodes anymore. In this trial, the Wrinkle reduction treatment offered improvement of symptoms for up to 6 months. By significantly lessening leakage, Wrinkle reduction treatment can provide positive impact on your life. First, there is no need for overplanning every single detail of your activity beforehand. Having an overactive bladder often cause avoidance and limiting behaviour because of worrying on the bathroom location or limiting how much liquid to drink. Second, a person may feel worried or embarrassed that the symptoms such as leakage might be noticed by other people. Thanks to Wrinkle reduction treatment , you’ll feel confident to go out without worries. Lastly, having an OAB makes you frustrated or preoccupied with how your condition affects your daily decisions like what to wear, where to go and how you feel on your general wellbeing.